Harley Quinn Smith wears black high top Converse “Chuck Taylor” All Stars in the film. Sam McCarthy wears green low top Converse “Chuck Taylor” All Stars in the film. Salena Qureshi wears red low top Converse “Chuck Taylor” All Stars in the film. Simon, Howie, and their mom Carla seated on the front steps of their flat. 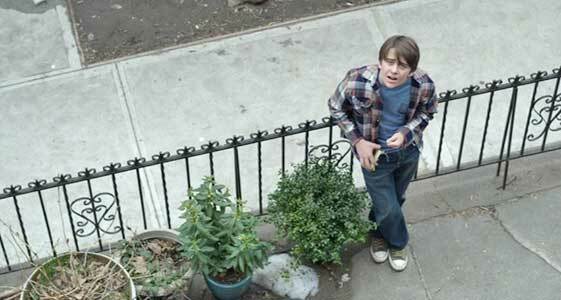 Howie Sheffield (Brendan Meyer) lacks focus in his daily life. He doesn’t seem to have much in the way of outside or school interests. He is not involved in sports at school, and a broken arm even keeps him from participation in gym class. He doesn’t have an interest in the arts or a steady girlfriend, and his somewhat icy and uncommunicative nature keeps him at arm’s length from his friends and classmates. Howie lives in Brooklyn with his younger brother Simon (Sam McCarthy) and parents Carla and Tom (Molly Ringwald and Brian d’Arcy James), but we soon find out that their marriage is on the verge of breaking up. The one thing that does intrigue Howie is a thirty-something lady (Jemima Kirke) that he sees on his daily bus rides to school. Later we learn that her name is Odessa, that she is in the process of a divorce, and that she runs a stall at the local farmers market. Odessa has a look to her that is both mysterious and attractive to Howie, with golden blonde hair, poetic eyes, exposed small tattoos on her skin, and pleasant demeanor. Although they have opportunities to meet and converse during their daily contact riding and waiting for the bus, Howie’ poor communication skills result in a somewhat awkward silence with her most of the time. Instead he does things like making sure he looks his best for the bus rides, insisting that Simon exchanges shirts with him in an early scene so he doesn’t show a stained sleeve, or following Odessa around to find more about where she lives and what she does during the day. Simon is outside about to fly his kite. At school we meet some of the other classmates of Howie, including Katie (Salena Qureshi) and Lindsay (Harley Quinn Smith) in his gym class. Due to asthma, Lindsay is temporarily excused from gym and spends that period with Howie in the school library. Lindsay is very much attracted to Howie, but he resists her advances, despite her repeated attempts to get better acquainted. Lindsay is still dealing with bad rumors about her that were spread by another student after he tried to go too far with her too soon, and was beaten up by her older brother. Howie thaws somewhat as the days and weeks pass due to her persistence, but his interest is still in Odessa throughout most of the film. He even writes poetry about Odessa that he awkwardly reads in his English class. Another facet of Howie’s life is his relationship with Simon. Simon is part of his life, allowed to hang with Howie and his friends at their house, and the two boys do most things together. Simon is much more outspoken about the imminent breakup of their parents’ marriage, and he does funny things like trying to fly a kite when he really doesn’t know how to keep it afloat and away from obstructions like trees. In a family where most of the members are hiding their true feelings, Simon is the most honest about his, and he can’t stand the uncertainty of his parent’s breakup..
Lindsay and another boy who just broke his leg in the library. The other main story line of All These Small Moments is the deteriorating relationship between Carla and Tom, Howie and Simon’s parents. Their marriage has gone flat, and the magic that caused them to fall in love is seemingly gone from their lives. In counseling sessions Tom describes how his feelings for Carla were magical, and each time they got together the magic grew. Carla uses the analogy of the grebe, birds who mate for life, and have a ritual crossing of a large to determine whether they will mate or not. When she and Tom got together they were like the happily successful grebes but now she doesn’t think they could make that long trek across the lake any more. Their interests have changed and they don’t spend much time together. More practically it seems Tom has been having an affair, and Carla can’t sleep in the same bed with Tom anymore, something that Howie points out grimly to Simon, when they see bedding from sleeping on the couch stacked in the closet. Their parent’s marriage is on the edge of disaster and the boys are ill-equipped to deal with this major change in their home lives. Howie and Simon confronting Tom about their family situation. Those are the main components of All These Small Moments. As the title implies, the film is made up of a series of vignettes in the lives of the Sheffield family, with most of the focus on Howie as he starts to come of age. The point of this style of story telling is that it is meant to simulate the real life of ordinary people as much as possible. The story elements happen in small increments over a period of time. This is the film’s strength but also its weakness, as things tend to move quite slowly and the viewer doesn’t get any resolution of the issues brought up in the film until the final few scenes. None of the characters are particularly dynamic, but again that is part of the concept. The film is well cast and occasionally there are sparks in the performances of the women characters, played by Molly Ringwald, Jemima Kirke, and Harley Quinn Smith, as well as young Sam McCarthy as the younger brother most affected by what has been happening to his family. The main focus of the film is on the emotionally frozen Howie as played by Brendan Meyer. It isn’t until the very end of the film that you see him emerge into the character you were hoping to see for most of the film. Again your point of view determines whether this is a strength or weakness of the film. Writer/director Melissa Miller Costanzo’s concept for the film remains true to a simple vision of modern life and how ordinary people deal with issues of life, friendship, and family. Lindsay waits in the hall for Howie. Katie getting ready for gym class. Three of the teenaged characters in this film wear chucks: Harley Quinn Smith as Lindsay wears black high tops, Sam McCarthy (Andrew McCarthy’s son) as Simon wears green low tops that are an olive or sea mist shade, not bright green, and Salena Qureshi as Katie wears red low tops. Like most teens who wear chucks, these three live in them, so you see them throughout the film. The best scene in the film is with Katie at school where she is seen lacing up her red chucks for gym class and giving a class report in them. The shot of her getting ready for gym class was also made into a graphic as part of the opening credits for the film. Lacing up a pair of chucks is an important small moment in people’s lives. Katie gives her report in class. All These Small Moments. (2018) Molly Ringwald, Brendan Meyer, Jemima Kirke, Harley Quinn Smith, Simon McCarthy, Brian d’Arcy James, Salena Qureshi. Written and directed by Melissa Miller Constanzo.